H influenzae was first isolated during the 1892 influenza pandemic and was originally believed to be the causative agent of influenza. 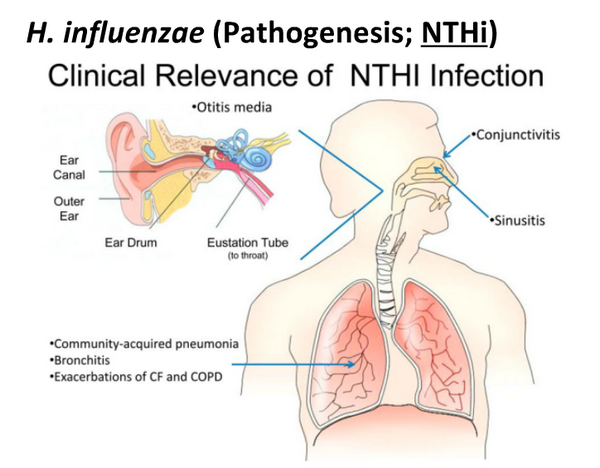 Although subsequent studies revealed the fallacy of this idea, H influenzae has proved to be a common cause of localized respiratory tract and systemic disease, including meningitis, epiglottitis, pneumonia, pyogenic arthritis, cellulitis, otitis media, and sinusitis, among others (Box 1). Meningitis is the most common and serious form of invasive H influenzae type-b disease. In the mid-1980s, before the introduction of effective vaccines, ~ 10,000-12,000 cases of H influenzae type-b meningitis occurred in the United States each year, and 95% of cases involved children < 5 years old. Nowadays, there are < 200 cases/year, with most episodes occurring after 5 years of age. Symptoms usually include fever, irritability, lethargy, and vomiting. Antecedent symptoms of an upper respiratory infection are common. Occasionally, the course is fulminant, with rapid neurologic deterioration leading to respiratory arrest. Shock is present in 20% of cases of meningitis and can be associated with coagulopathy and purpura. Bacteria can almost always be recovered from CSF. In roughly 70% of patients with H influenzae meningitis, Gram stain of the CSF is positive for gram-negative coccobacilli. In cases of culture-proven meningitis, capsular antigen can be detected ~ 90% of the time in CSF and even more frequently in concentrated urine. False-positive reactions are uncommon, but occasionally occur owing to cross-reactivity with E coli, S pneumoniae, Staphylococcus spp., or Neisseria meningitidis. Complications of H influenzae type-b meningitis include subdural effusion or empyema, ischemic or hemorrhagic cortical infarction, cerebritis, ventriculitis, intracerebral abscess, and hydrocephalus. The overall mortality rate is ~ 5%. Among survivors, between 5% and 10% have permanent sensorineural hearing loss, and ~ 30% have some other significant handicap. Tests for more subtle neurologic deficits reveal sequelae in up to one-half of survivors. 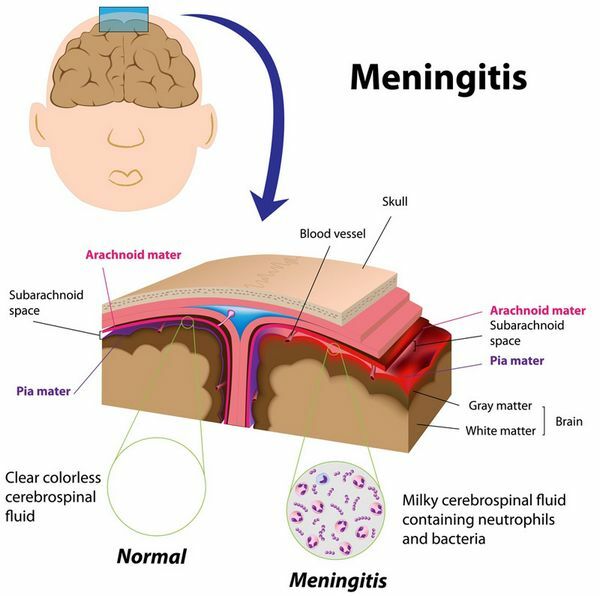 Meningitis caused by nontypable H influenzae is usually associated with sinusitis, otitis media, or an anatomic communication between the upper respiratory tract and the central nervous system, and results from direct extension from the contiguous focus of infection. 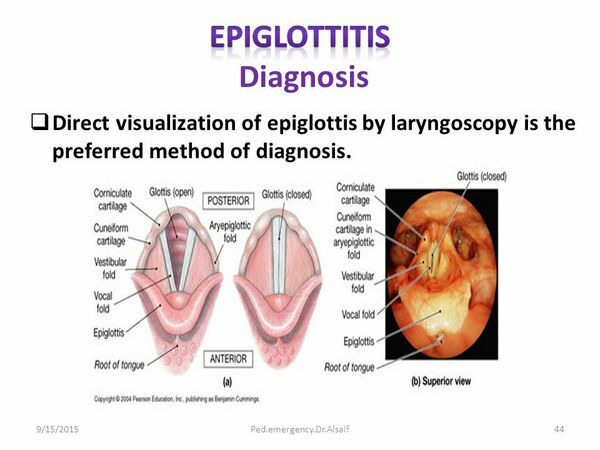 Epiglottitis is a life-threatening infection involving cellulitis of the epiglottis and the aryepiglottic folds. Complete obliteration of the vallecular and pyriform sinuses is typical, and acute airway obstruction can occur. Symptoms are often sudden in onset and usually include high fever, sore throat, and dyspnea, with rapid progression to dysphagia, pooling of secretions, and drooling. In children < 2 years old, fever may be low grade, dysphagia and drooling may be minimal, and a croup-like cough may be present. Regardless of age, the patient is usually restless and anxious and adopts a sitting position with the neck extended and the chin protruding to reduce airway obstruction. Abrupt deterioration can occur within a few hours, resulting in death unless an artificial airway is established. Cultures of the epiglottis usually are positive but should be obtained only after establishment of an artificial airway. Direct laryngoscopy at the time of controlled placement of an endotracheal tube reveals a red and swollen epiglottis and swollen aryepiglottic folds. On lateral neck radiograph, the swollen epiglottis produces the "thumb sign." Generally, H influenzae pneumonia is more insidious in onset than is pneumonia caused by Staphylococcus aureus or Streptococcus pneumoniae. Productive cough, fever, pleuritic chest pain, and dyspnea dominate the clinical presentation. Pneumonia caused by H influenzae is usually associated with a consolidative pulmonary infiltrate. In 50% of cases caused by H influenzae type b, there is evidence of pleural involvement on initial chest radiograph, and up to 90% of these patients have pleural fluid recoverable by thoracentesis. An important complication is contiguous spread to the pericardium, resulting in purulent pericarditis, which is manifest by severe dyspnea (grunting in infants), tachycardia, and cardiac failure. Although patients with H influenzae type-b pneumonia often have persistent pleural reaction with secondary restrictive lung function at the time of hospital discharge, long-term abnormalities are rare. 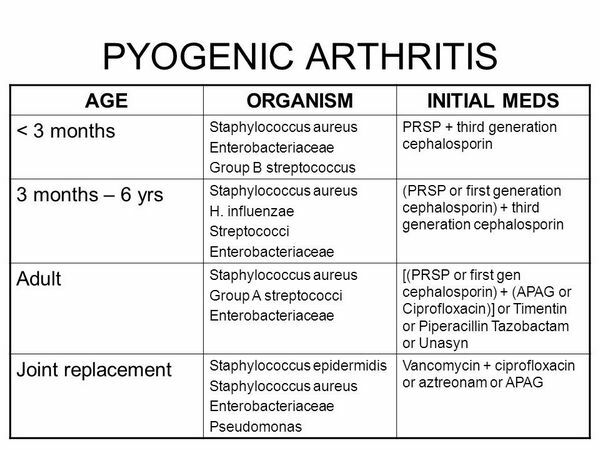 In the pre-Haemophilus vaccine era, H influenzae type b was the most common cause of pyogenic arthritis in children < 2 years of age. In most cases a single large, weight-bearing joint (hip, knee, or ankle) is involved, and in 10-20% of patients, contiguous osteomyelitis develops. Response to systemic antibiotics in combination with prompt drainage of the joint is dramatic, but long-term follow-up is important because residual joint dysfunction can occur. On occasion, culture-negative arthritis develops during treatment of H influenzae type-b meningitis, presumably as a result of immune complex deposition in the joint. In 75% of patients with reactive arthritis, signs of joint inflammation begin after a week or more of therapy. Cellulitis is the result of metastatic spread of blood-borne H influenzae type b. Typically, the patient presents with fever and a warm, tender area of erythema or violaceous discoloration on the cheek or in the periorbital area. 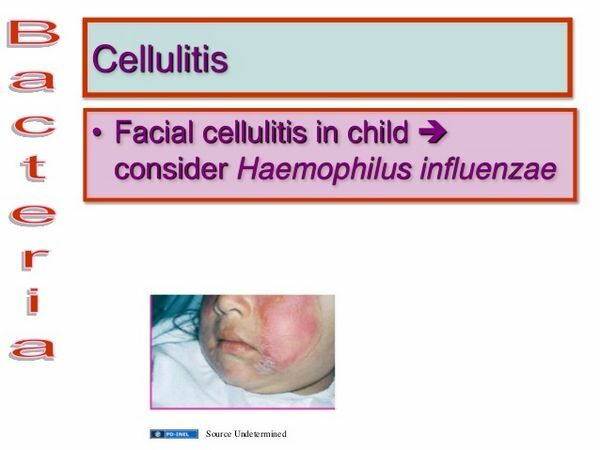 Cheek (buccal) cellulitis invariably occurs in children < 1 year of age. The age of the child, the location of the cellulitis, and the occasional distinctive violaceous color should suggest the etiology. Aspirate cultures, either from the center of the lesion or the leading edge, usually yield the organism. Related to the fact that bacteremia is generally present, ~ 10% of children develop another focus of infection, for example, meningitis. H influenzae is not associated with cellulitis that occurs as a complication of trauma to the skin. Among H influenzae isolates from patients with acute otitis media, > 90% are nontypable. Based on studies reported from the United States and Scandinavia, the peak age-specific incidence of H influenzae acute otitis media is between 6 and 15 months. Characteristic manifestations include ear pain, fever, irritability, sleep disturbance, and otorrhea. On examination, the tympanic membrane is usually red or yellow and bulging with distorted landmarks. Pneumatic otoscopy reveals decreased mobility, indicative of middle ear fluid. In addition to producing acute otitis media, nontypable H influenzae is the most common bacterial etiology of otitis media with effusion, which is typically asymptomatic and is characterized by a minimally discolored and often retracted tympanic membrane. Nontypable H influenzae is also associated with dual infection of the conjunctiva and the middle ear, referred to as the "conjunctivitis-otitis syndrome." H influenzae accounts for ~ 30% of all cases of acute sinusitis. The majority of patients with sinusitis have nasal discharge or cough that persists without improvement for > 10 days. Other patients present acutely with high fever and purulent nasal discharge. Physical examination often reveals tenderness over the involved paranasal sinuses. Because sputum frequently is contaminated by pharyngeal bacterial flora, the interpretation of H influenzae growth from sputum cultures is difficult. Nevertheless, there is reasonable evidence that H influenzae plays a role in exacerbations of chronic bronchitis, bronchiectasis, and cystic fibrosis. Most isolates in these patients are nontypable. The clinical presentation is characterized by increases in dyspnea, sputum production, and sputum purulence, sometimes associated with fever. During the past 2 decades, nontypable H influenzae has become recognized as a cause of early onset neonatal sepsis similar to that caused by group B streptococcus. Disease occurs primarily in premature neonates and is associated with a mortality rate of nearly 50%. Most infants develop symptoms within the first few hours of life, with pneumonia and respiratory distress dominating the clinical presentation. Meningitis occurs infrequently. H influenzae usually can be cultured from the genitourinary tract of mothers of infected infants, often in association with maternal postpartum endometritis. At least one study indicates that a large percentage of these isolates are biotype IV, a subgroup of nontypable H influenzae found uncommonly at other sites of infection. Genotypic analysis of these biotype IV strains suggests that they represent a distinct Haemophilus species. Brazilian purpuric fever is characterized by high fever, abdominal pain, and vomiting. In most patients, purpura and vascular collapse develop within 12 h of fever onset. Patients range in age between 3 months and 10 years, and ~ 90% have a recent history of conjunctivitis, which in most cases begins 1-2 weeks before the onset of fever. Aside from blood cultures, laboratory studies are nonspecific. Leukocyte counts are often elevated, with a preponderance of neutrophils and band forms, and thrombocytopenia and prolonged coagulation times are also seen. 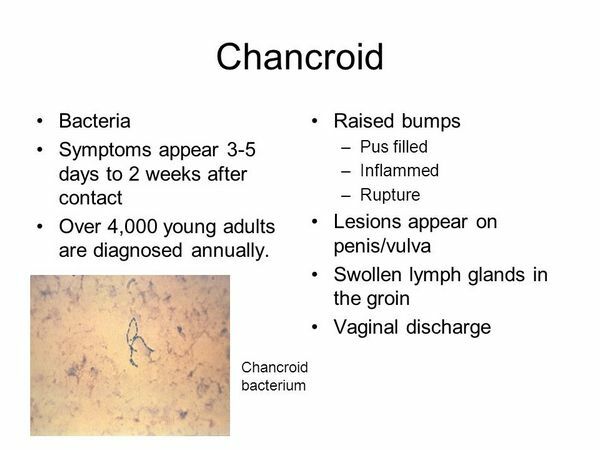 Chancroid usually begins with a papule on the genitalia that develops after an incubation period of 4-7 days. The papule is typically surrounded by erythema and evolves over 2-3 days to a pustule, which spontaneously ruptures to form a sharply circumscribed ulcer. The ulcer is characterized by tenderness and a tendency to bleed. The surrounding skin generally lacks evidence of inflammation. Roughly 50% of patients develop inflamed inguinal lymph nodes, which often become fluctuant and rupture spontaneously. On occasion, chancroid presents with multiple ulcers that coalesce. In addition, ulcers can appear and then resolve spontaneously, with the development of suppurative inguinal adenitis 1-3 weeks later. Gram stain of material obtained by swabbing a lesion can show gram-negative bacteria in a "school of fish" configuration. Consideration of the diagnosis of meningitis, epiglottitis, pneumonia, pyogenic arthritis, or cellulitis is usually prompted by the history and physical examination (Table 2). In most cases of invasive H influenzae type-b disease, blood cultures are positive. H influenzae is often cultivated from samples of pleural fluid, joint fluid, or pericardial fluid in affected patients. The type-b capsular polysaccharide is secreted during bacterial growth, and detection of capsular antigen in serum, CSF, urine, and other normally sterile body fluids can help establish the diagnosis. Antigen detection techniques are most valuable in patients who have received prior antibiotic therapy and have sterile cultures. In addition, they may be useful in confirming a diagnosis before bacterial growth is appreciated in the clinical laboratory, thus allowing for earlier chemoprophylaxis of contacts (see below). Of note, H influenzae type-b conjugate vaccines can produce positive reactions in urine and CSF for days to weeks after vaccination. Because H influenzae is a common commensal organism in the upper respiratory tract, establishing H influenzae as an etiology of localized respiratory tract disease is challenging. Procedures such as tympanocentesis, sinus aspiration, tracheal or lung aspiration, bronchoscopy, and bronchoalveolar lavage can provide a definitive diagnosis, but generally are reserved for patients with persistent or recurrent infection or an underlying immunodeficiency. Several studies have examined the predictive value of surface cultures of the nose, throat, or nasopharynx in patients with acute or chronic sinusitis. Although the organisms isolated from direct aspiration of infected sinuses are generally recovered from surface cultures, they are not consistently the predominant organisms. As a result, surface cultures are of minimal value in establishing an etiologic diagnosis; nevertheless, they may be useful to exclude a particular cause. In patients with chancroid, an accurate diagnosis relies on cultivation of H ducreyi from the lesion. Selective and supplemental media are necessary for isolation. Although a variety of media have been used, the highest rates of recovery from clinical samples have been obtained with chocolate agar containing Isovitale X and 3 ug/mL of vancomycin; GC agar base containing 1-2% hemoglobin, 5% fetal bovine serum, and 3 ug/mL of vancomycin; and Mueller-Hinton agar supplemented with horse blood, Isovitale X, and vancomycin. For optimal recovery, cultures are incubated at 33 °C in a humid CO2-enriched environment. Colonies are of pinpoint size at 24 h and increase to 1-2 mm in diameter at 48 h.
In blood culture, Haemophilus species other than H influenzae and H ducreyi have a tendency to grow in small colonies along the sides of the bottle or in the red blood cell mass, leaving the broth clear. As a result, recovery of these organisms from the blood of patients with endocarditis is enhanced by routine subculture of blood cultures to chocolate agar, use of a biphasic system, or use of a system that detects growth radiometrically. Empiric therapy for invasive disease caused by H influenzae generally includes either a third-generation cephalosporin, such as cefotaxime or ceftriaxone, or the combination of ampicillin and chloramphenicol (Box 2). In the United States, ~ 30% of H influenzae isolates are resistant to ampicillin, and thus ampicillin should never be used alone as empiric therapy. Ampicillin resistance usually is related to plasmid-mediated production of ß-lactamase, but occasionally is caused by decreased affinity of certain penicillin-binding proteins. To distinguish one form of resistance from the other, both disk susceptibility testing and a ß-lactamase assay should be performed. Chloramphenicol is bactericidal for H influenzae and reliably penetrates into the CSF. Although resistance to chloramphenicol has been reported, it remains rare in the United States, especially among invasive isolates. In recent years, the third-generation cephalosporins have become the treatment of choice for H influenzae meningitis. Both cefotaxime and ceftriaxone have potent activity against H influenzae (including ampicillin-resistant isolates) and achieve high levels in the CSF. For patients with uncomplicated meningitis, therapy for 7-10 days is adequate. For patients who fail to respond promptly or develop complications, therapy for > 10 days may be necessary. Based on empiric experience, most experts recommend that other invasive infections caused by H influenzae also be treated with an appropriate parenteral antibiotic for 7-10 days. Among patients with invasive H influenzae disease, antibiotic therapy represents only one component of management. In patients with meningitis, optimal ventilation and judicious fluid administration are important. In addition, dexamethasone should be administered with the first dose or before initiation of antibiotic therapy, whenever possible (without delaying institution of treatment). Dexamethasone serves to diminish production of tumor necrosis factor and other cytokines that contribute to development of cerebral edema and neurologic sequelae. Patients with epiglottitis require placement of an artificial airway, and children with pneumonia often require treatment with supplemental oxygen. When pleural empyema, purulent pericarditis, or pyogenic arthritis is present, prompt drainage is essential to good outcome. Otitis media, sinusitis, pneumonia, and exacerbations of underlying lung disease are often treated effectively with oral amoxicillin, but amoxicillin-clavulanate, trimethoprim-sulfamethoxazole, an oral second- or third-generation cephalosporin, erythromycin-sulfisoxazole, azithromycin, and clarithromycin are acceptable alternatives (Box 3). Historically, treatment of otitis media and sinusitis was continued for 7-14 days, but recent evidence suggests that shorter courses of therapy are equally efficacious. Treatment for 7-10 days is usually adequate for pneumonia and bronchitis. Several antibiotic regimens are effective in the treatment of chancroid. These include ceftriaxone, 250 mg IM as a single dose, azithromycin, 1 g orally as a single dose, and erythromycin, 500 mg orally four times daily for 7 days. Alternative regimens that have not been evaluated as thoroughly include ciprofloxacin, 500 mg orally twice daily for 3 days, and amoxicillin-clavulanate, 500 mg-125 mg, orally three times daily for 7 days. If therapy is successful, ulcers begin to improve within 3 days and usually resolve after 7 days of treatment. Clinical isolates often have plasmid-mediated resistance to ampicillin, chloramphenicol, tetracyclines, and sulfonamide and may be resistant to other antibiotics as well. Thus, when patients do not respond to treatment promptly, susceptibility testing should be performed. Short courses of therapy may be ineffective in patients with HIV infection. Traditionally, uncomplicated infections from other Haemophilus species have been treated with ampicillin. Haemophilus endocarditis has been treated with high-dose ampicillin, often in combination with an aminoglycoside. However, resistance to ampicillin, usually related to ß-lactamase production, is being recognized with increasing frequency. Consequently, a second- or third-generation cephalosporin (eg, ceftriaxone) should be used until antibiotic susceptibility results are available (see Box 2). Antibody to the H influenzae type-b capsule is bactericidal for type-b organisms and confers protection against invasive disease (Box 4). Accordingly, the existing vaccines against H influenzae type b contain some derivative of type-b polysaccharide, also called polyribosylribitol phosphate (PRP). To enhance the immunogenicity of these vaccines in young infants, the polysaccharide is conjugated to an immunogenic carrier protein. There are currently four licensed conjugate vaccines, all differing to some extent in the size of the polysaccharide, the chemical linkage between the polysaccharide and the carrier, or the type of protein (see Table 3). In addition, these vaccines differ in immunologic characteristics. As a result of differences in immunogenicity, three of the four (HbOC, PRP-T, and PRP-OMP) are licensed for use in infants, and the fourth (PRP-D) is approved only for children = 12 months of age. For HbOC and PRP-T, the primary series of infancy consists of three doses (at 2, 4, and 6 months of age), whereas for PRP-OMP the primary series includes two doses (at 2 and 4 months). In all cases, a booster dose is required between 12 and 15 months of age. All four of the conjugate vaccines are well tolerated, with the most common adverse effect being transient redness and swelling at the site of injection. Conjugate vaccines can be administered at the same time as other vaccines, including diphtheria-tetanus-whole-cell pertussis (DTP) or diphtheria-tetanus-acellular pertussis (DTaP), polio, hepatitis B, mumps-measles-rubella (MMR), varicella, pneumococcal vaccines, and meningococcal vaccine, and in some cases have been combined during production with DTP, DTaP, or hepatitis B. Postlicensing studies indicate that the available conjugate vaccines are highly effective against H influenzae type b and have decreased the incidence of invasive H influenzae type-b disease by > 95%; however, these vaccines provide no protection against non-type-b strains. 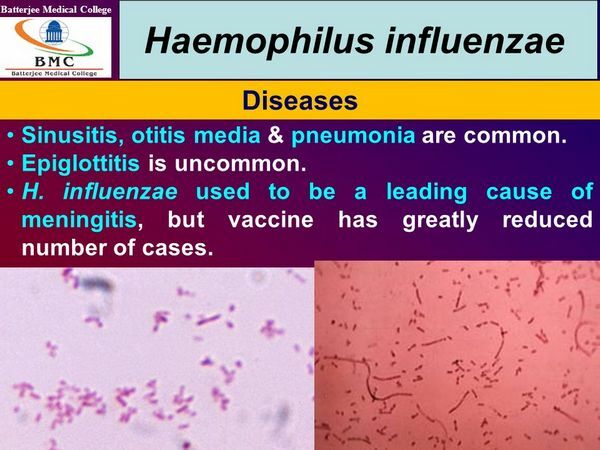 There are currently no vaccines available for prevention of disease caused by nontypable H influenzae or other Haemophilus species. However, work is underway to identify nontypable H influenzae and H ducreyi antigens that are surface exposed and elicit protective antibody, and several promising candidates exist. Chemoprophylaxis is another important intervention for preventing invasive disease caused by H influenzae type b. The intent is to eradicate nasopharyngeal colonization and thereby prevent subsequent invasion of the bloodstream in individuals at increased risk for invasive disease. Eradication of colonization will also interrupt transmission to other susceptible hosts. In households with a child < 12 months old, the index case and all members of the household should receive rifampin prophylaxis. The same is true in households with at least one contact < 48 months old who is incompletely immunized against H influenzae type b and in families with a fully immunized but immunocompromised child, regardless of age. When two or more cases of invasive disease occur within a 60-day period among attendees of a child care center and incompletely vaccinated children attend the facility, rifampin is recommended for all attendees and supervisors. Management of a single case at a child care center is controversial and depends on the age and immunization status of attendees and the duration of daily contact between attendees and the index patient. Because most secondary cases in households occur during the first week after hospitalization of the index case, chemoprophylaxis should be initiated as soon as possible. Chemoprophylaxis is also a consideration in children who have recurrent otitis media caused by nontypable H influenzae (or other typical pathogens). In this situation, chronic prophylaxis with either amoxicillin or sulfisoxazole may be effective in reducing infectious episodes, an effect that must be balanced against the possibility of selecting for resistant organisms. According to a recent report, among patients who develop conjunctivitis caused by the BPF clone of H influenzae biogroup aegyptius, oral rifampin may be effective in preventing BPF.